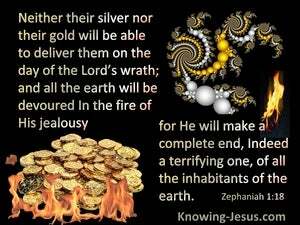 ﻿ Zephaniah 1:18 Neither their silver nor their gold Will be able to deliver them On the day of the LORD'S wrath; And all the earth will be devoured In the fire of His jealousy, For He will make a complete end, Indeed a terrifying one, Of all the inhabitants of the earth. Even their silver and their gold will not be able to keep them safe in the day of the Lord's wrath; but all the land will be burned up in the fire of his bitter wrath: for he will put an end, even suddenly, to all who are living in the land. their silver and their gold shall not be able to deliver them, in the day of Jehovah's wrath; but the whole land shall be devoured by the fire of his jealousy: for a full end, yea, a sudden end, shall he make of all them that dwell in the land. Neither their silver nor their gold shall be able to deliver them in the day of the LORD's wrath, but the whole earth shall be devoured by the fire of his jealousy; for he shall make even a speedy riddance of all those that dwell in the earth. Also their silver also their gold shall not be able to deliver them in the day of the wrath of Jehovah; and all the land shall be consumed by the fire of his jealousy: for he will make a completion even sudden of all dwelling in the land. 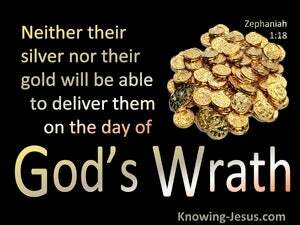 Moreover, their silver and their gold will not be able to save them on the day of the wrath of Yahweh. And in the fire of his zeal, the whole land shall be consumed, for a terrifying end he shall make [for] all the inhabitants of the land. Their silver nor their gold will not be able to deliver them in the day of Jehovah's wrath; but the whole land shall be devoured by the fire of His jealousy. For He shall make even a full, yea, a speedy end of all the dwellers in the land. Neither their silver nor their gold shall be able to deliver them in that wrathful day of the LORD, but the whole land shall be consumed through the fire of his jealousy: for he shall soon make clean riddance of all them that dwell in the land. Neither their silver nor their gold will be able to deliver them in the day of the Lord's angry judgment. The whole earth will be consumed by his fiery wrath. Indeed, he will bring terrifying destruction on all who live on the earth." Neither their silver nor their gold will be able to deliver them in the day of the LORD's wrath, but the whole land will be devoured by the fire of his jealousy; for he will make an end, yes, a terrible end, of all those who dwell in the land. Neither their silver nor yet their gold, shall be able to deliver them, in the day of the indignation of Yahweh, but, in the fire of his jealousy, shall the whole earth be consumed; For, a destruction, surely a terrible one, will he make, with all them who dwell in the earth. Neither their silver nor their gold shall be able to deliver them in the day of the LORD'S wrath; but the whole land shall be devoured by the fire of his jealousy: for he will make even a speedy riddance of all them that dwell in the land. 17 I will bring distress on men So that they will walk like the blind, Because they have sinned against the LORD; And their blood will be poured out like dust And their flesh like dung. 18 Neither their silver nor their gold Will be able to deliver them On the day of the LORD'S wrath; And all the earth will be devoured In the fire of His jealousy, For He will make a complete end, Indeed a terrifying one, Of all the inhabitants of the earth. I looked, and behold, the fruitful land was a wilderness, And all its cities were pulled down Before the LORD, before His fierce anger.